Photography by Jessica Claire. Courtesy of Matchbook Magazine. 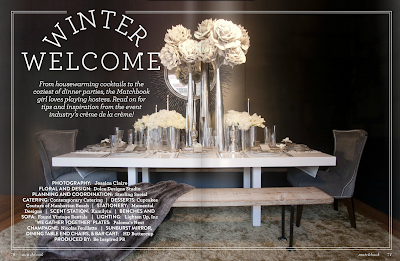 This story entitled Winter Wonderland is beautifully styled and the photography rivals any found at your local newsstand. 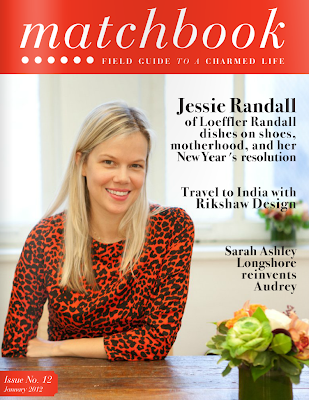 I guarantee you will love all the entertaining tips from experts in the floral, party-planning, cooking, baking and design worlds. A perfect way to jump start your planning for winter-time soirees. 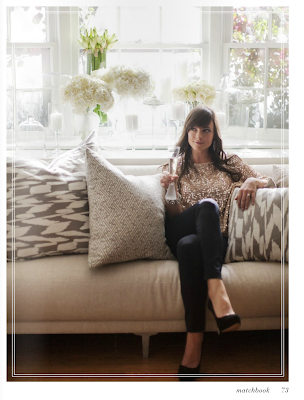 I'm DYING over the silver and white pillows and matching runner on the dining table. Does anyone recognize these fabrics? Photography by Heather Schneider. Courtesy of Matchbook Magazine. I had never heard of Ashley Longshore until I read this wonderful article last week and after clicking through her website, she can count me as a fan! 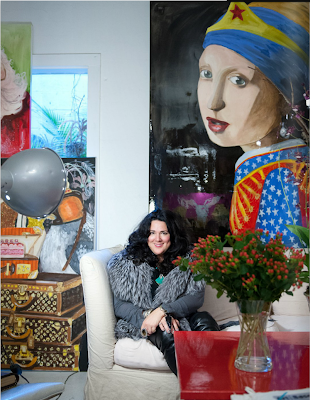 You'll love reading about why she is up and painting by 6:00 a.m. and what it was like to give Salma Hayek painting lessons. 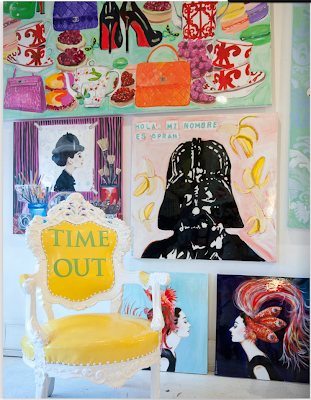 Ashley's story behind her famous "Time Out" chair is food for thought. It's hard to believe she is self-taught! Photography by Rima Campbell. Courtesy of Matchbook Magazine. 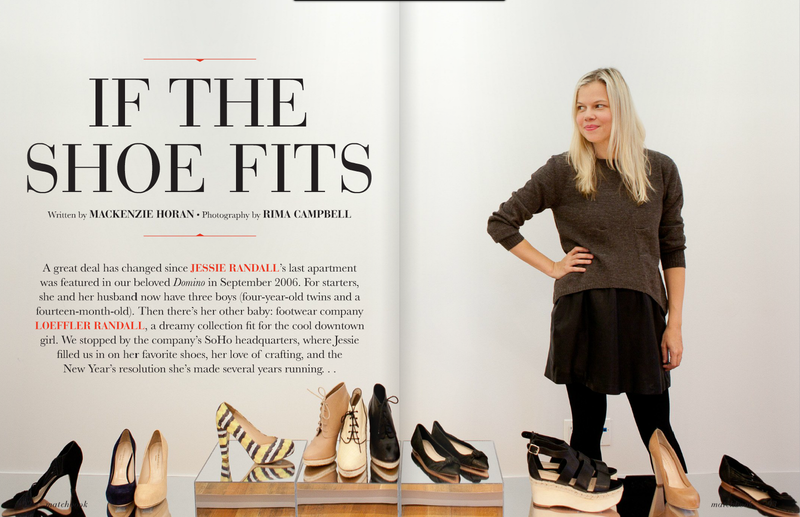 As a longtime fan of Loeffler Randall, the feature on it's founder Jessie Randall was a great read. I especially liked hearing the fact that she's got 3 kids under 4, wakes up with her youngest at 5:00 a.m. everyday, and is still able to run this phenomenally successful company. So us gals CAN do it all, right? This pair is on my to-buy list - the Blaise Flat Moccasin. Check out the entire new Loeffler Randall resort collection here. Love Matchbook. Though I haven't read the latest issue, so thank you for the reminder. Ok, I'm off to go read, but before I do I just have to say, Loeffler Randall's latest collection is crazy good. Wowzers! Welcome! I like flea markets, The New Yorker, champagne cocktails, and Paris. Kate Moss is my style icon, hydrangeas are my favorite flower, and I dream about Cindy Sherman photographs and John Currin paintings. Nurture Yourself - Loafer Chic! 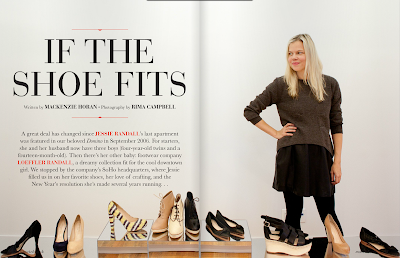 Spring Clean Your Closet With Help From The Closetnista!